Facet is our designer privacy screen. The entire screen consists of separate facets that are placed in such a way that a mesmerizing geometric room divider is formed. Placing this room divider in any space will add some texture and interest to the room. Everybody that sees it will be captivated by the striking design of this beautiful, yet simple object. 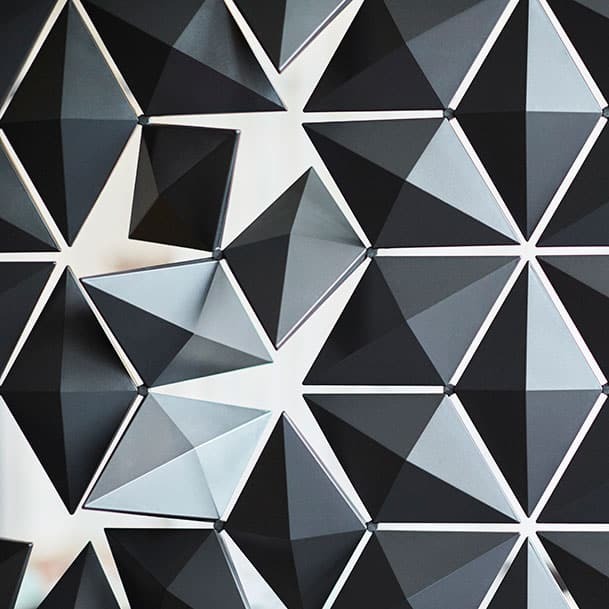 Personalize your geometric room divider. Each individual facet can rotate around its axis. 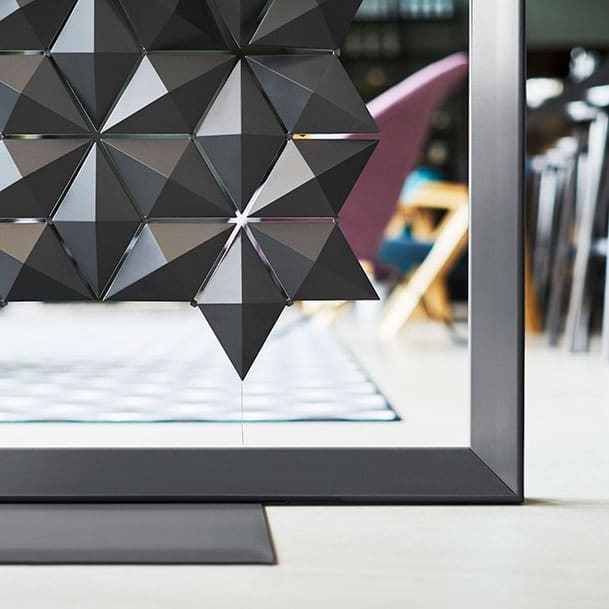 This means that you can adjust the transparency of your geometric room divider. You can also play with the pattern of the screen and make it look different every day. These facets come in six different colors: White, Pearl Gray, Pale Blue, Dijon, Chestnut and Graphite. They are made from a durable material that is fire retardant, UV-resistant and anti-static. Install the geometric room divider in 6 steps. If you decide to purchase the standing room divider, it will be delivered along with the frame and a clear step-by-step guide to install the divider in your space. Facet is extremely lightweight and is therefore easy to handle and install. The geometric room divider featured here is in a restaurant in Eindhoven, the Netherlands. It is from our standing room divider collection. These room dividers come with a frame, which means you do not have to fasten it to your ceiling. The frame can also be moved around if you want to change the layout of your space. In these pictures, you can see the geometric divider in the color Graphite. The first picture also illustrates the possibilities you have with twisting the diamond-shaped facets around.